Spring is playing some strange games this year. It has been chilly in North Carolina this week, but all I want to do is lie in the grass reading a book, surrounded by lovely flowers. Lots and lots of flowers. Until the weather warms up for good, I’ll have to settle for cooking with them. Some flowers have edible leaves or petals that are safe to eat as long as they’re pesticide-free. Roses, geraniums, violets, pansies, honeysuckle and nasturtiums — to name just a few — all make for colorful and luscious additions to many dishes. I’ve been on a lavender kick lately. 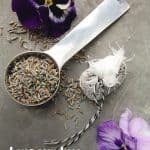 Not only does lavender have soothing, relaxing qualities, but its unique flavor adds a floral dimension to both sweet and savory foods. Remember the Sugar Doughnut Muffins rolled in lavender sugar I made a few weeks back? I’ve been addicted ever since. 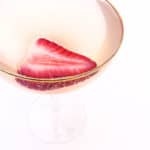 Easter is on Sunday, and I’ve been hunting for the perfect cocktail for a spring Sunday brunch. It seemed like an opportune time to experiment with lavender in cocktails. 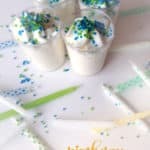 I went with the champagne cocktail, an elegant drink for special occasions. 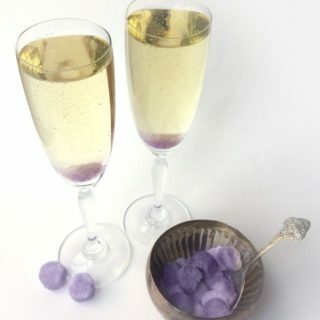 They’re typically made with sugar cubes soaked in Angostura bitters and topped with champagne or other sparkling wine. For this version, we’ll dye the sugar purple and flavor it with lavender extract , then shape it into cubes using an ice cube tray or candy mold. 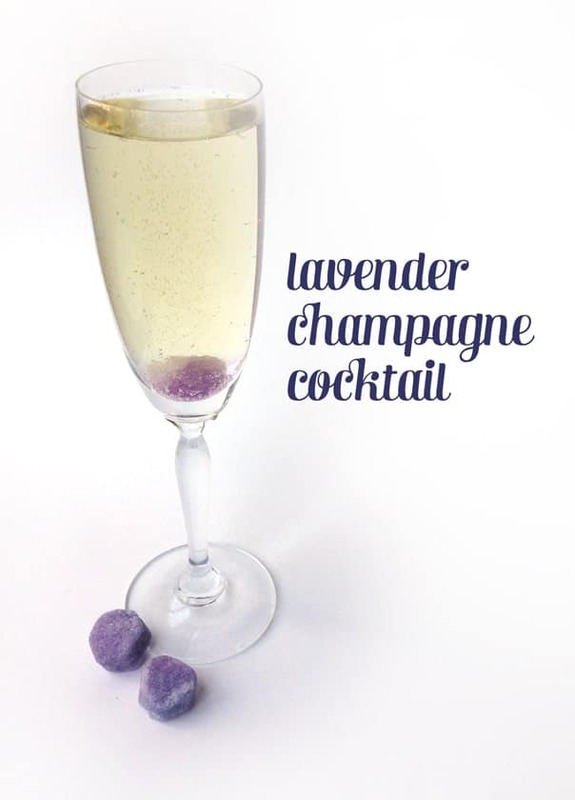 Pop one into a glass of bubbles, and it’s like drinking a sparkling field of lavender flowers. 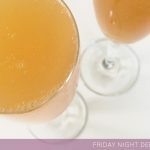 Click below to see the recipe for Lavender Champagne Cocktails! Make the sugar cubes. 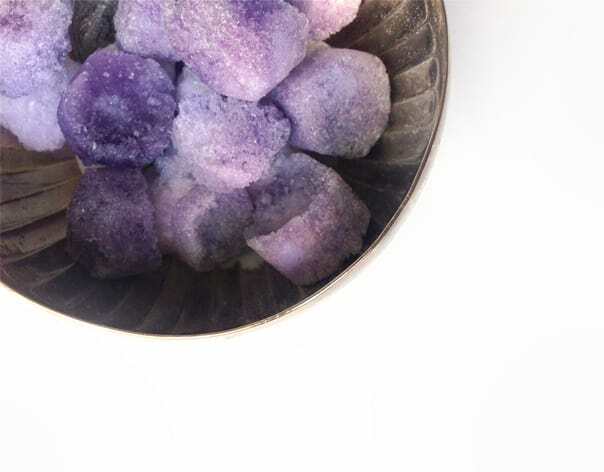 Make lavender sugar cubes at least one day ahead of time. Add the sugar to a medium bowl, then pour in lavender extract, water and food colors. Mix well, until color is evenly distributed. With a metal spoon, distribute the sugar into the compartments of the ice cube tray or candy mold. With your fingers, press the sugar into the molds to pack it in tightly. (This will help your cubes to stay together and not crumble once they've dried.) Set in a cool, dry place to harden for at least 2 hours or overnight (recommended). Gently, pop out the cubes, which are now ready to use. Store in an airtight container. Make the cocktail. 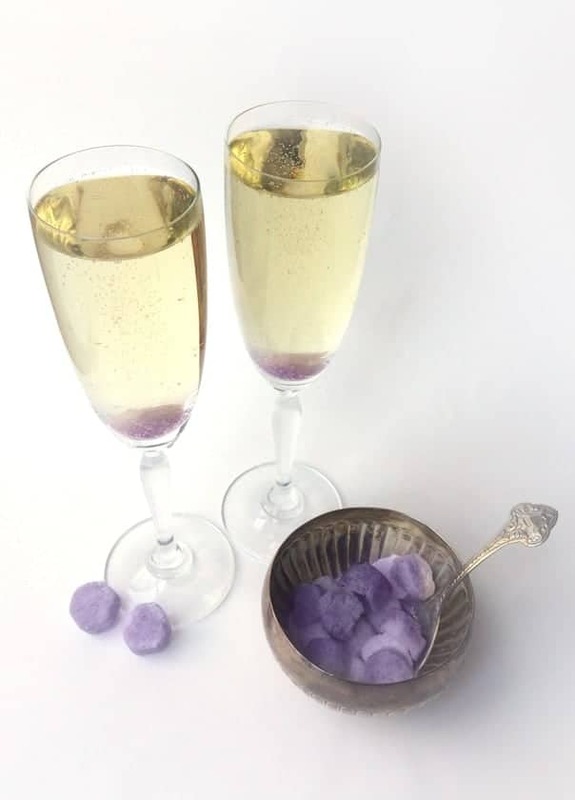 Place a lavender sugar cube in the bottom of a champagne flute. Add vodka. Top glass with champagne. Serve immediately. Makes approximately one dozen sugar cubes (depending on size of tray/molds). This post contains affiliate links. Thank you for your support of Feast + West!